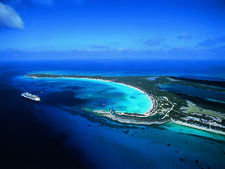 Nassau, with its blend of influences from West Africa to England and from Haiti to the United States, is one of the most popular (and often congested) cruise ports in the Caribbean and Bahamas. The port is vibrant and easily navigable, offering beachy activities and affordable souvenirs. It's commercialized and often crowded; pushy locals hinder relaxation by hawking their wares. This is a great destination for first-timers looking for affordable beach time. The yellow and blue stripes on the Bahamian flag represent the nation's sandy beaches and surrounding ocean, while the black triangle stands for unity and the people's determination to develop the land and the sea. 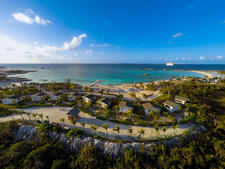 With endlessly developing hotels, resorts and shopping areas, it isn't hard to make this connection in Nassau, the capital of the Commonwealth of the Bahamas. 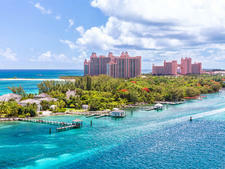 Nassau is located on the 21-mile-long-island of New Providence and is connected, via bridge, to Paradise Island, another popular Bahamian destination. The city of Nassau features tropical, tree-lined streets, filled with horse-drawn surreys, ruled by policemen in white starched jackets and colorful pith helmets; soft-sanded beaches for kicking back and catching ocean breezes; lavish, Vegas-type casinos; and a decent range of duty-free shopping stops. But, as much as this vibrant town center is a cruise visitor's first impression, most head out on beach adventures at massive hotel and resort complexes like Atlantis or on boating adventures that range from dolphin encounters to booze cruises. 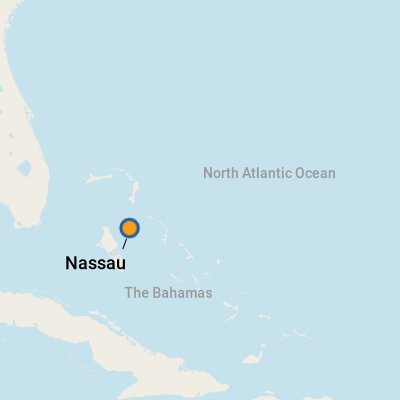 Nassau's central location, just off the coast of Southern Florida, is one of its chief pluses, making it an easy mini-cruise port of call for ships passing through on the way to the Caribbean islands. You'll dock at Prince George Wharf, near Rawson Square and the Bahamas Ministry of Tourism -- great for picking up maps, brochures, etc. 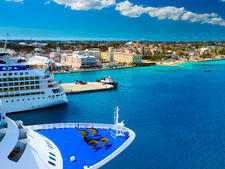 -- in the heart of Nassau. Passengers must pass through Festival Place to exit the port facility, and it's one of the more impressive we've seen in any port of call. Counters are staffed by tourism folks, who will provide maps and answer questions, as well as by companies that offer boat trips, over-land tours and taxi services. There's also a small Internet cafe. Beyond that is a small, but colorful, shopping mall that specializes in artisan boutiques. A steel-pan band offers a musical welcome, and a food court features stalls that sell local conch. While there's no need to be especially alert, it does pay to leave valuables and excess cash in your stateroom safe and keep an eye on your surroundings. Renting a Car: There are a handful of car-rental companies, such as Dollar, Avis, Thrifty and Budget at Prince George Wharf, as well as on Paradise Island and at the airport. But, they're pretty expensive, ranging in price from $55 to $110 for the day. There's also that pesky left-side-of-the-road driving to deal with. Taxis are plentiful and can be hailed everywhere, be it right by your ship or at all the hotels and restaurants. Count on sharing the taxi with other tourists and locals. Fares should be established before getting in a taxi, as meters aren't run. Check in advance for the estimated price for where you want to go. 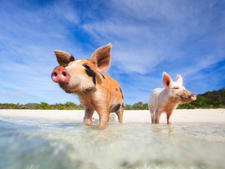 Typical fares to Paradise Island are $4 per person, plus a 15 percent gratuity. Expect about a $15 fare to Cable Beach. A taxi tour is a great way to familiarize yourself with the island -- with your driver serving as something of a local guide -- but expect to pay more. These types of fares are negotiable. By Bus: The jitney buses run every few minutes between the downtown area to Cable Beach from about 6 a.m. to 6:30 p.m. Fares vary (though they're generally about $1.25 per person, each way, $1 for small children), depending on the route. Exact change is required. Jitneys do not go over the Paradise Island bridge. By Water Taxi: The Nassau Water Taxi departs every 30 minutes from behind the Festival Market to Paradise Island, operating daily from 9 a.m. to 6 p.m. The roundtrip cost is $8, or $4 each way. Notes: Though the trip takes just 10 minutes, the water taxi may not depart on time. Because the operators tend to give you a bit of a "tour" along the way, expect to be approached for a gratuity. By Horse-Drawn Surrey: These can be found around Rawson Square and sometimes along Bay Street. They run about $15 per person for 25 minutes, but the price is usually negotiable. Note: From May to October, the horses rest from the sun from 1 p.m. to 3 p.m.
Legal tender is the Bahamian dollar, which is equivalent in value to the U.S. dollar. Both U.S. and Bahamian dollars are accepted interchangeably throughout the island. European currency is not, so exchange it as necessary at a bank or ATM. (You'll find them at Rawson Square, Bay Street and at the casinos.) All banks and their branches are generally open 9:30 a.m. to 3 p.m. Monday through Thursday and until 5 p.m. on Friday. For more currency exchange information, visit www.xe.com or www.oanda.com. Editor's note: Some hotels and restaurants add a fee for cashing traveler's checks. English is spoken in the Bahamas. Graycliff is an eccentric, glorious, 20-room hotel with a gourmet restaurant that claims a 250,000-bottle wine cellar, a humidor and an onsite cigar-rolling facility. (Don't miss it -- it's fascinating, and you can buy the stogies at the onsite boutique.) It offers a wine luncheon, featuring continental cuisine with Bahamian influences, Monday through Friday from 11:30 a.m. to 2:30 p.m. Saturday lunch is for hotel guests only. Reservations are a must. (Call 1-800-476-0446 in the U.S./Canada or 1-242-302-9150 from other places.) The per-person cost for three courses, including wine, will run about $75. Graycliff is located across from Government House on W. Hill Street; it's within walking distance from the port. Junkanoo handicrafts are always a sure bet and can be found throughout the island. You can find Oswald Greenslade, once Bacardi Bartender of the Year, at the Poop Deck in SandyPort (near Cable Beach). Author of the book One More Cocktail (available for purchase at the Poop Deck), Greenslade is also the mixologist behind our favorite Bahamian concoctions. Splish Splash is a heavenly drink made from Bacardi Select, Nassau Royal Liqueur, pineapple juice, bananas, cream and sugarcane syrup, but his colleagues insist he is best known for his Bahama Mama. If your ship offers an evening call, try happy hour from 5 p.m. until 7 p.m. (closed Mondays) -- complete with complimentary treats. Your best chance of catching Greenslade (and maybe even an autographed copy of his book) is on Friday nights.